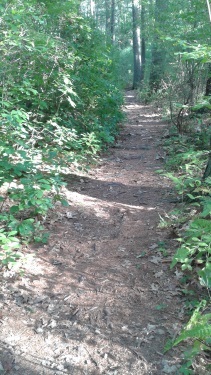 hiking trails continue in Marshfield. While Stetson Meadows and it's hiking trails play a part in the history of the area, the Marshfield side and it's trails have been a well guarded secret in the past, and unknown to many still. from the original owner Coronet Robert Stetson. for his service to the English Government. Then known as the 100 acre farm. Most important was it's frontage on the North River. Robert Stetson helped build the first saw mill. Saw mills produced lumber, lumber would eventually play a large part in the shipbuilding industry along the North River. The land at Bald Hill on the Norwell side is where Stetson's son Benjamin opened the Bald Hill Shipyard. 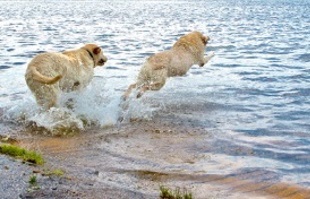 Present day, the North River plays an important part as it is the playground for an ever increasing boater population. The hiking trails on this side of the meadows are accessed by finding your way to Couch Cemetery on Union St. in Marshfield. Toward the back of the cemetery there are two ways to access trails. Along the right side of the Cemetery road a small half fence can be found with a few parking spaces and a gate in front of a wide dirt road. Following the dirt road into the area is an easy walk through a fairly dense vegetated area. Along the way you will pass through a wetland with protected vegetation. This may help to create the "island"
that the town calls Blueberry island. After a 1/2 mile hike you will reach the area that many refer to as Couch Beach. Others refer to this area as "The Gut" and older references "The Garbage Gut". What it actually is, is a spectacular place that many of the locals love. 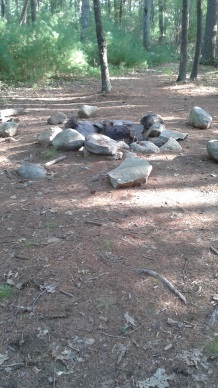 Wide opened forest with an established fire ring complete with seating. Those that obtain a permit to camp here, receive a key to the gate allowing them to drive their vehicles on to the property. Others have arrived carrying in their belongings. these will find a fairly large beach along the river. 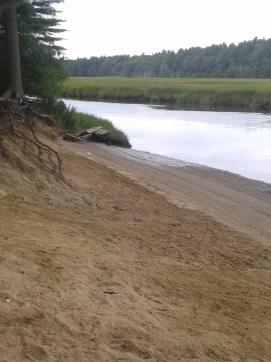 The sand does extend into the river. individuals grabbing hold of the last weekends left to get some camping in. 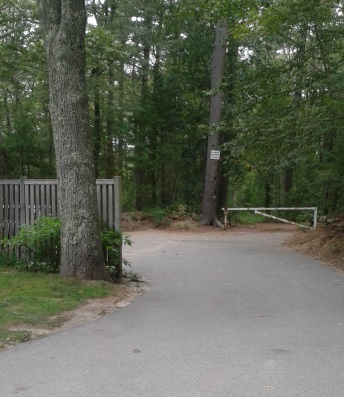 The other way to access the area from the cemetery is across from the large dirt road. is a path that leads into the forest. but on the other side of the clearing. Along the way a path leads off to the left where another more inland campsite exists. 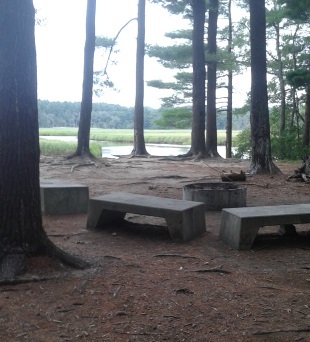 There are several of these alternate campsites in the area. Beyond this camping spot the trail continues and leads to the far side of the island along a marshy inlet of the river. 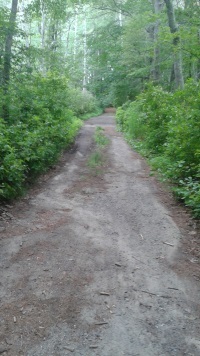 There is another side trail on the opposite side of the clearing that brings one to yet another marshy side of the river, passing a field of blueberry bushes on the way. Exploring these two trails one can see why the area is referred to as an island. It may very well turn into one during times of high water! 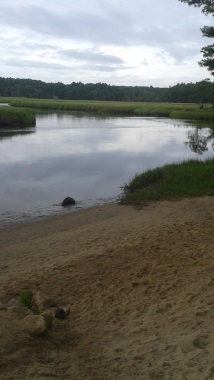 Another view of the beautiful North River! from exit 12 on route 3 head east on route 139. Take next left on Old Oak St. This soon becomes Union St at the Marshfield border. Follow approx. 1 1/2 miles til Couch Cemetery on the left. There will be signs directing to it. Follow the main road straight back. 3-4 vehicles in front of the gate. Additional parking at the rear of the cemetery near the path in on the left. Light: 1-2 miles of hiking.